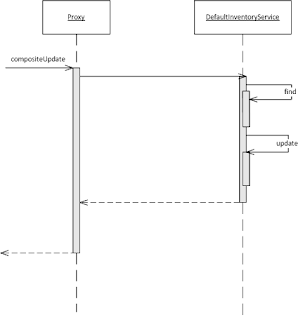 In the lines highlighted above, the test is dependent on a Spring Integration specific component - a Message Channel, and in the test an explicit Spring Integration Message is constructed and sent to the Message Channel. There is a little too much coupling with Spring Integration which is the Messaging System here. 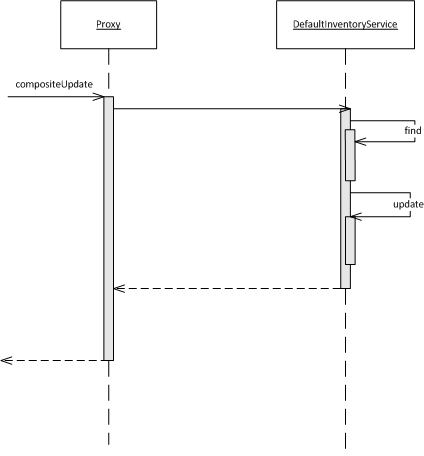 A Gateway component provides a facade to the messaging system, shielding the user application(in this case the Unit test) from the details of Messaging System - the messaging channel, Message and explicit sending of a message. The Greeter interface above is the Gateway component. Now that this component has been introduced there is no dependency to Spring Integration in this test - there is no mention of Message, Message Channel in the code at all. The highlighted line above creates the Gateway component out of the Greeter interface, a proxy is created in the background which handles everything that was being done explicitly earlier - creating the messaging and sending the message to the message channel. The lines in red are being printed to syserr and in black are being printed to sysout. So the question is why are some of them going to sysout and some of them going to syserr and why not to both? The answer is because of the type of channel - "messagesChannel" above is a "Direct Channel" in the Spring Integration terminology and has "Point to point" semantics. The point-to-point semantics basically means that when a message comes into the Messaging Channel, only 1 receiver gets the message - so in this case either the standard out adapter OR the standard err adapter ends up printing the message that is coming into the message channel. So this completes the introduction to a Gateway component, Direct Channel and Publish Subscribe channel. There was an interesting question in Stackoverflow about how a Spring Bean can get a reference to the proxy created by Spring to handle transactions, Spring AOP, Caching, Async flows etc. A reference to the proxy was required because if there is a call to itself by the proxied bean, this call would completely bypass the proxy. A good fix for this is to use the full power of AspectJ - AspectJ would change the bytecode of all the methods of DefaultInventoryService to include the call to the advice. A workaround that we worked out was to inject a reference to the proxy itself into the bean and instead of calling say this.findByVin and this.update, call proxy.findByVin and proxy.update! and then define a BeanPostProcessor to inject in this proxy! Not the cleanest of implementations, but works! 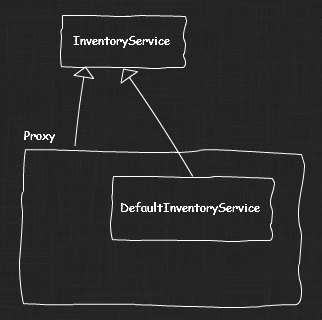 Once this is done, in the proxied class, the reference to the proxy can be obtained by calling AopContext.currentProxy()! Before jumping into the program itself, a quick review of messaging concepts will be helpful - Messaging is an Integration style where two independent applications communicate with each other through an intermediary - the intermediary is referred to as the "Messaging System". Enterprise Integration Patterns describes the common Integration related issues with Messaging based application Integration and their recommended solutions. An enterprise has two separate applications that need to communicate, preferably by using Messaging. Connect the applications using a Message Channel, where one application writes information to the channel and the other one reads that information from the channel. All the other Enterprise Integration Patterns are described along the same lines. The reason to quickly visit Enterprise Integration Patterns is to set the context - Spring Integration aligns very closely with the Enterprise Integration Patterns and is the "Messaging system" that was mentioned earlier. Here a MessageChannel is being wired into the test, the first application (here the Junit), sends a Message(in this case a string "Hello World") to the Message Channel, something reads the message from the "Message Channel" and writes the message to the system out. 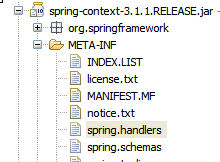 The above is a Spring Integration flow being described using Spring Custom namespaces, here the Integration Namespace. A "Message Channel", imaginatively called the "messageChannel" is created, a "Hello World" "Message" is placed into the "Messsage Channel", from which a "Channel Adapter" gets the message and prints it to the standard out. This is a small program, but it uses three Enterprise Integration Patterns - the Message ("Hello World", which is the packet of information being sent to the messaging system, the "Message Channel" which was introduced earlier and the new one, the Channel Adapter, here an Outbound Channel Adapter which connects the messaging system to the application(in this case the system out). It further shows how Spring Integration aligns very closely with the Enterprise Integration Patterns terminology with its Spring custom namespace. This simple program introduces Spring Integration, I will be introducing Spring Integration in more detail using a few more samples in the next few sessions.